DC USB-C output 5V/9V/12V/15V/20V max 65W for Compatible with 2016 2017 New Macbook Pro 13 15 inch, Macbook 12 all models. 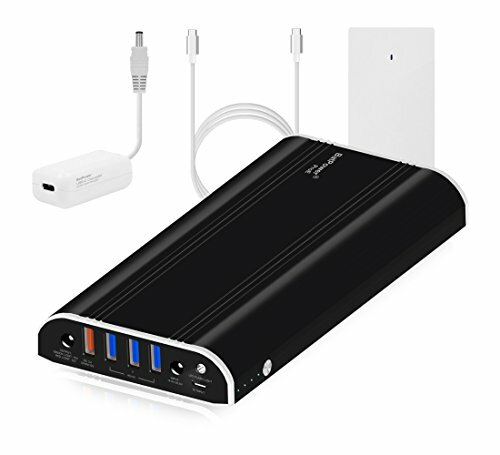 PC USB-C output 5V/9V/12V/15V/20V max 65W for Compatible with New HP Spectre 360, Lenovo Yoga, Asus Transformer Book, LG Gram, Dell Precision, XPS, Razer Blade Stealth Ultrabook, Acer Aspire, MSI Gt, and more PD USB-C devices. DC USB-C output 5V/9V/12V/15V/20V max 90W for Compatible with 2016 2017 New Macbook Pro 13 15 inch, Macbook 12 all models. DC USB-C output 5V/9V/12V/15V/20V max 90W for Compatible with New HP Spectre 360, Lenovo Yoga, Asus Transformer Book, LG Gram, Dell Precision, XPS, Razer Blade Stealth Ultrabook, Acer Aspire, MSI Gt, and more PD USB-C devices. The BatPower ProE PD technology automatically detects and delivers 5V, 9V, 12V, 15V or 20V(Max90W) based on your devices needs; Tested for 2016 2017 Macbook Pro Touch Bar, Two and Four Thunderbolt 3 Ports, Macbook 12, HP Spectre Lenovo Yoga Asus Transformer Book LG Gram Dell Precision XPS Razer Blade Stealth Acer Aspire MSI Gt and more USB-C Laptops Tablets or Smartphones(Note: Please use Genuine Type C Cable). Charges for 2016 2017 Macbook Pro Touch Bar approach 1.5 times, iPad Mini 1 approach 4.0 times, iPhone 10 times and Samsung Galaxy S6 approach 8 times. Recharges in around 3-3.5 hours via BatPower PAD 90W adapter (included). PD9 size: 7.2 inches (L) x 3.3 inches (W) x 0.7 inches (H) Weight: 20 ounces. Packing list: BatPower PD9 Portable Charger, Type C to Type C Cable, PAD 90W PD Charger, AC Power Cord (L=4ft), Instructions Manual. (Note: if Sold by Euro, will be packed UK and EU Power Cords).